Pretty Cure All Stars: Singing with Everyone Miraculous Magic! 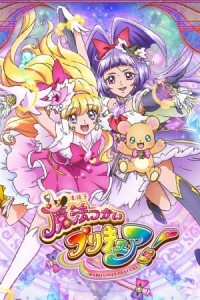 Also known as: Eiga PreCure All Stars: Minna de Utau Kiseki no Mahou! It's the eighth and last PreCure All Stars movie! These are insane team-ups of every PreCure superheroine to date, including a movie-only one (Cure Echo) because including everyone from all the TV series just hadn't been enough! In other words, this is the ultimate. This would be the last and biggest crossover ever. From 2107 onwards, sanity prevailed. The Pretty Cure Stars movies would continue, but with only the three most recent teams and without the word "ALL" in the title. It hadn't been so bad at the start. The first All Stars movie was in 2009, so it only had four teams and fourteen PreCures. By 2016, though, the roster had bloated to 11 teams, 44 heroines and 33 talking mascot animals. Oh, and for luck they also resurrect ten classic villains and a bunch of secondary non-superpowered characters (for cameos). How well does this work? Answer: better than you'd think. It's got a plot, unlike last year. I'd even call it sensibly structured, although admittedly it achieves this by pushing most of the older PreCures into a dungeon and not giving most of them dialogue. The film begins with Mirai and Riko (2016) walking down the street and spontaneously bursting into song. That will happen quite often. It's a Disney moment. The bystanders become back-up dancers. Oh, and everyone in the cinema audience has been given a Miracle Stick Light that they'll have to turn on and wave whenever the characters on-screen ask them to. Our two Maho Girls heroines bump into the Go Princess PreCures (2015), only for a 2015 baddie (Dyspear) to show up and start trashing the town. FIGHT! This is actually cool, if you've watched the respective series. Every PreCure gets her authentic transformation sequence and even her original theme song as incidental music. This pattern then continues. Mirai and Riko go back through recent franchise history, meeting the DokiDoki! and HappinessCharge PreCures as yet more old enemies show up for a rumble. There's a master baddie resurrecting them, you see. Her name's Solciere and she wants PreCure tears! The storyline's fairly predictable, really. The baddie's sad underneath, really, and our heroines will help her! I think it's less fun than the 2015 All Stars movie, for instance, because that was barking mad. However it does one thing that impressed me, though, by building successful drama around the "never give up" heroic determination of every anime ever. (I only exaggerate slightly.) You see, Mirai and Riko do give up! They get split up and beaten up. They fall into despair. They even sing a song about this. "It's impossible." "There's no way I can beat that monster." What's more, this fits since "friendship" had been the key theme of Maho Girls PreCure! and they only transform as a pair, not on their own. The film then helps them get over it. They rediscover their determination, so their eventual "never give up" shout at the finale feels both earned and more meaningful than usual. It's a perfectly solid film, amazingly. I wouldn't even call it unwieldy. It has humour (e.g. the ill-coordinated Rubbish PreCures) and it's probably watchable as a standalone film even if you're a PreCure newbie. (Well, assuming you can handle the Disney-esque musical numbers, the "wave your Miracle Stick Light" scenes and the conveyor belt of schoolgirl superheroines.) Personally I'd call it less entertaining than a film that's gone completely hatstand, but I was surprised to see competence and efficiency in an All Stars movie at all. It's pretty good.